Not to be confused with Hindi belt or Hindu. Modern Standard Hindi (Hindi: मानक हिन्दी mānak hindī) or simply Hindi (Hindi: हिन्दी hindī), is a standardised and Sanskritised register of the Hindustani language. Hindi is one of the official languages of the Union of India, and the lingua franca of the Hindi belt languages. Hindi is the fourth-most spoken first language in the world, after Standard Mandarin Chinese, Spanish and English. The official language of the Union shall be Hindi in Devanagari script. The form of numerals to be used for the official purposes of the Union shall be the international form of Indian numerals. At the state level, Hindi is the official language of the following Indian states: Bihar, Chhattisgarh, Haryana, Himachal Pradesh, Jharkhand, Madhya Pradesh, Rajasthan, Uttar Pradesh, and Uttarakhand. Each may also designate a "co-official language"; in Uttar Pradesh, for instance, depending on the political formation in power, this language is generally Urdu. Similarly, Hindi is accorded the status of official language in the following Union Territories: Andaman & Nicobar Islands, Chandigarh, Dadra & Nagar Haveli, Daman & Diu, National Capital Territory. National-language status for Hindi is a long-debated theme. An Indian court clarified that Hindi is not the national language of India because the constitution does not mention it as such. Outside Asia, Hindi is an official language in Fiji as per the 1997 Constitution of Fiji, where it referred to it as "Hindustani", however in the 2013 Constitution of Fiji, it is simply called "Hindi". Hindi is also spoken by a large population of Madheshis (people having roots in north-India but have migrated to Nepal over hundreds of years) of Nepal. Hindi is quite easy to understand for some Pakistanis, who speak Urdu, which, like Hindi, is part of Hindustani. Apart from this, Hindi is spoken by the large Indian diaspora which hails from, or has its origin from the "Hindi Belt" of India. A substantially large Indian diaspora lives in countries like The United States, United Kingdom, The United Arab Emirates, Saudi Arabia and few other countries, where it is natively spoken at home and among their own communities. Outside India, Hindi speakers are 100,000 in the United States; 485,170 in Mauritius; 250,292 in South Africa; 232,760 in Yemen; 107,000 in Uganda; 3,000 in Singapore; 8 million in Nepal; 20,000 in New Zealand; 20,000 in Germany. Like other Indo-Aryan languages, Hindi is considered to be a direct descendant of an early form of Sanskrit, through Sauraseni Prakrit and Śauraseni Apabhraṃśa. It has been influenced by Dravidian languages, Turkic languages, Persian, Arabic, Portuguese and English. Hindi emerged as Apabhramsha (Sanskrit:अपभ्रंश; Corruption or corrupted speech), a degenerated form of Prakrit, in the 7th century A.D. By the 10th century A.D., it became stable. Braj, Awadhi, Khari Boli etc. 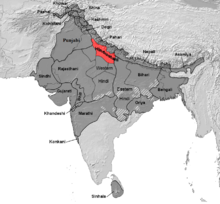 are the dialects of Hindi. The dialect of Hindustani on which Standard Hindi is based is Khariboli, the vernacular of Delhi and the surrounding western Uttar Pradesh and southern Uttarakhand. Urdu- literally meaning, "camp", as in "Zuban-i-Urud yi-Mualla" or "language of the exalted camp" (of the Mughals)- a dialect of Hindustani, acquired official linguistic prestige in the later Mughal period (1800s). In the late 19th century, the movement standardising a written language from Khariboli, for the Indian masses in North India, started to standardise Hindi as a separate language from Urdu, which was learnt by the Mughal elite. In 1881, Bihar accepted Hindi as its sole official language, replacing Urdu, and thus became the first state of India to adopt Hindi. The Constituent Assembly adopted Hindi as an official language of India on 14 September 1949. Now, it is celebrated as Hindi Day. Linguistically, Hindi and Urdu are two registers of the same language. Hindi is written in the Devanagari script and uses more Sanskrit words, whereas Urdu is written in the Perso-Arabic script and uses more Arabic and Persian words. Hindi is the most commonly used official language in India. Urdu is the only official language of Pakistan , and is one of the 22 official languages of India. Hindi is written in Devanagari script (देवनागरी लिपि devanāgarī lipi). Devanagari consists of 11 vowels and 33 consonants and is written from left to right. It is an abugida as well. Tatsama (तत्सम "same as that") words: These are words which are spelled the same in Hindi as in Sanskrit (except for the absence of final case inflections). They include words inherited from Sanskrit via Prakrit which have survived without modification (e.g. Hindi नाम nām / Sanskrit नाम nāma, "name"; Hindi कर्म karm / Sanskrit कर्म karma, "deed, action; karma"), as well as forms borrowed directly from Sanskrit in more modern times (e.g. प्रार्थना prārthanā, "prayer"). Pronunciation, however, conforms to Hindi norms and may differ from that of classical Sanskrit. Amongst nouns, the tatsam word could be the Sanskrit non-inflected word-stem, or it could be the nominative singular form in the Sanskrit nominal declension. Tadbhava (तद्भव "born of that") words: These are words that are spelled differently from in Sanskrit but are derivable from a Sanskrit prototype by phonological rules (e.g. Sanskrit कर्म karma, "deed" becomes Pali कम्म kamma, and eventually Hindi काम kām, "work"). Videshī (विदेशी "foreign") words: These include all loanwords purportedly from non-indigenous languages. The most frequent sources identified in this category have been Persian, Arabic, English and Portuguese. Examples are कमेटी kameṭī from English committee and Hindi साबुन sābun "soap" from Arabic]. Much of Modern Standard Hindi's vocabulary is derived from Sanskrit, either as tatsama or tadbhava, especially in technical and academic field. The Hindi standard, from which much of the Persian, Arabic and English vocabulary has been purged and replaced by neologisms compounding tatsam words, is called Shuddha Hindi (pure Hindi), and is viewed as a more prestigious dialect over other more colloquial forms of Hindi. Excessive use of tatsama words creates problems for native speakers. They may have Sanskrit consonant clusters which do not exist in native Hindi. The educated middle class of India may be able to pronounce such words, but others have difficulty. Persian and Arabic vocabulary given 'authentic' pronunciations cause similar difficulty. Hindi also features significant Persian influence, standardised from spoken Hindustani. Many have come to take the place of tatsama vocabulary, such as दरवाज़ा darvāzā "door" (tatsama द्वारा dvārā), and many more are used alongside tatsama words. Hindi literature is broadly divided into four prominent forms or styles, being Bhakti (devotional – Kabir, Raskhan); Shringar (beauty – Keshav, Bihari); Virgatha (extolling brave warriors); and Adhunik (modern). Medieval Hindi literature is marked by the influence of Bhakti movement and the composition of long, epic poems. It was primarily written in other varieties of Hindi, particularly Avadhi and Braj Bhasha, but also in Khariboli. During the British Raj, Hindustani became the prestige dialect. Hindustani with heavily Sanskritised vocabulary or Sahityik Hindi (Literary Hindi) was popularised by the writings of Swami Dayananda Saraswati, Bhartendu Harishchandra and others. The rising numbers of newspapers and magazines made Hindustani popular with the educated people. Chandrakanta, written by Devaki Nandan Khatri in 1888, is considered the first authentic work of prose in modern Hindi. The person who brought realism in the Hindi prose literature was Munshi Premchand, who is considered as the most revered figure in the world of Hindi fiction and progressive movement. The Dwivedi Yug ("Age of Dwivedi") in Hindi literature lasted from 1900 to 1918. It is named after Mahavir Prasad Dwivedi, who played a major role in establishing the Modern Hindi language in poetry and broadening the acceptable subjects of Hindi poetry from the traditional ones of religion and romantic love. In the 20th century, Hindi literature saw a romantic upsurge. This is known as Chhayavaad (shadowism) and the literary figures belonging to this school are known as Chhayavaadi. Jaishankar Prasad, Suryakant Tripathi 'Nirala', Mahadevi Varma and Sumitranandan Pant, are the four major Chhayavaadi poets. The Hindi Wikipedia was the first Indic-language wiki to reach 100,000 articles. 1 2 Hindustani (2005). Keith Brown, ed. Encyclopedia of Language and Linguistics (2 ed.). Elsevier. ISBN 0-08-044299-4. 1 2 "Sequence of events with reference to official language of the Union". Archived from the original on 2 August 2011. ↑ Hammarström, Harald; Forkel, Robert; Haspelmath, Martin; Bank, Sebastian, eds. (2016). "Hindi". Glottolog 2.7. Jena: Max Planck Institute for the Science of Human History. 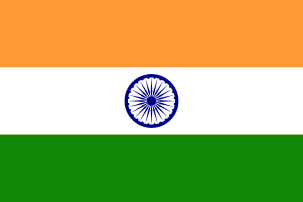 ↑ "Constitution of India". Retrieved 21 March 2012. ↑ "Rajbhasha" (PDF) (in Hindi and English). india.gov.in. Archived from the original (PDF) on 31 January 2012. ↑ "THE OFFICIAL LANGUAGES ACT, 1963 (AS AMENDED, 1967) (Act No. 19 of 1963)". Department of Official Language. Retrieved 9 June 2016. ↑ "Hindi, not a national language: Court". The Hindu. 25 January 2010. Retrieved 20 March 2014. ↑ "Section 4 of Fiji Constitution". servat.unibe.ch. Retrieved 3 May 2009. ↑ "Hindi and Urdu are classified as literary registers of the same language". ↑ Kachru, Yamuna (2006). Hindi. John Benjamins Publishing. ISBN 9789027238122. ↑ D., S. "Arabic and Hindi". The Economist. The Economist. Retrieved 13 April 2016. ↑ "Stop outraging over Marathi – Hindi and English chauvinism is much worse in India". Koul, Omkar N. (2008). Modern Hindi grammar (PDF). Springfield, VA: Dunwoody Press. ISBN 978-1-931546-06-5. Retrieved 19 July 2014. McGregor, R.S. (1995). Outline of Hindi grammar: With exercises (3. ed.). Oxford: Clarendon Pr. ISBN 0-19-870008-3. Retrieved 19 July 2014. Ohala, Manjari (1999). "Hindi". In International Phonetic Association. Handbook of the International Phonetic Association: a Guide to the Use of the International Phonetic Alphabet. Cambridge University Press. pp. 100–103. ISBN 978-0-521-63751-0. Gyani, Pandit, "," Hindi Biography & History. September 2016.